KATANA is our original multi-layered translucent zirconia, now available for chairside use with the CEREC® system. As most dentists conventionally prefer to cement their zirconia restorations with Resin Modified Glass Ionomer (RMGI) cement, this kit will allow them to follow the same protocol as RMGI, but with the added confidence of Kuraray’s legendary MDP monomer in the resin cement. Additionally, we have included CLEARFIL Universal Bond Quick (which can also be used for direct restorations) to enhance the bond strength when retention is questionable (ex. short clinical preps). In addition, it can be used with PANAVIA SA Cement Plus without any dual-cure activator. Chemical Bond to zirconia and tooth structure. 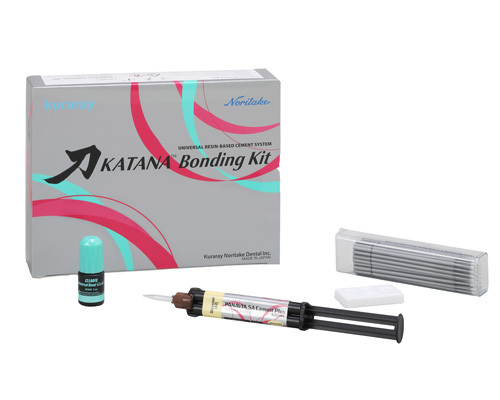 View cart “Katana Bonding Kit (3394KA)” has been added to your cart.